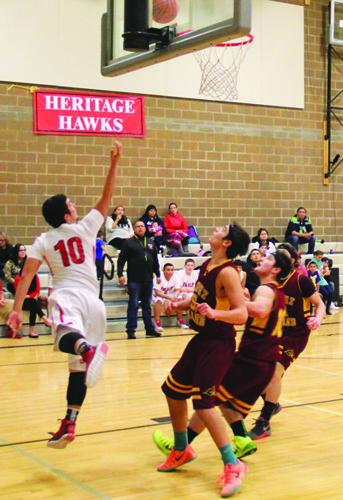 The Tulalip Heritage Hawks (6-2) hosted the Lopez Island Lobos (0-6) on Tuesday January 6, 2015. These two teams last played December 17, 2014 at Lopez Island, where the Hawks won 63-35 in a convincing fashion. The Hawks were on a 4 game winning streak until losing 53-57 at Three Rivers Christian on Saturday January 3, and wanted to get back to their winning ways in a hurry. The Hawks came out looking to make an early statement by playing a full-court defense and making sure every Lobos shot was contested. Their defense forced the Lobos into committing six turnovers on their first nine possessions. The Hawks turned those Lobos turnovers into transition buckets, going on an 11-2 run to open the game. The 3-ball was falling early as center Robert Miles, point guard Jesse Louie and guard Ayrik Miranda each made a 3-pointer during the run. The Lobos were able to successfully break the Hawks’ press a couple times in their next two possessions that led to them scoring easily at the rim. The Hawks responded by moving the ball on the offensive end and finding the open shooters. When the Lobos called timeout with 1:52 remaining in the first the Hawks led 18-8. The Hawks ended the quarter missing their last five shot attempts, but led by their stellar defense, including 4 steals by Robert Miles, the Hawks led 18-10 after the 1st quarter. Guard Ayrik Miranda hit his second 3-pointer to open the 2nd quarter. The Lobos answered with a jumper of their own. Forward Willy Enick collected two offensive rebounds on the next possession and scored a bucket of his own. The Lobos again answered with a bucket. When the Lobos called their 2nd timeout at the 5:00 mark of the quarter, the Hawks were leading 23-14. The rest of the 2nd quarter continued to be a back and forth affair with both teams seemingly trading buckets until the quarter ended. Going into halftime the Hawks led 31-22. “Offensively we are lackadaisical. You guys need to move the ball, pass more. Defensively quit reaching, slide your feet and get into position. You guys have to will yourself to work harder. You have to work hard. Stop the ball. Every time we pressure the ball something good happens,” coach Cyrus “Bubba” Fryberg stated as he urged his team to not play down to the level of their opponent. In the 3rd quarter both teams continued to trade baskets. The score was 40-28, following Ayrik’s third 3-pointer, when the Hawks called a timeout to give their starters a quick rest. On the very next play following their timeout Robert stole a Lobos inbounds pass and found Jesse wide open in the corner who hit his second 3-pointer of the game. The Hawks had their largest lead of the game 43-28 with 3:45 to go in the quarter. Moments later Ayrik displayed the defensive hustle his coach had asked for at halftime when he sacrificed his body and took a charge. For the next several offensive possessions the Hawks got 3-point happy and went 0-5 from beyond the arc. Meanwhile, the Lobos capitalized on their free throw opportunities by sinking four from the charity stripe. Robert finally ended the Hawks drought by scoring on a putback layup to put the Hawks up 45-32 with one more quarter to play. The 4th quarter saw Robert Miles attack the hoop and come away with four quick points and Trevor Fryberg hit his first 3-pointer of the game. Following a pair of Lobos free throws the Hawks had pushed their lead to 16 points, 52-36 with 5:33 to play. The teams again took turns trading baskets with both Robert and Ayrik countering Lobos baskets with 3-pointers. In the closing moments Robert collected his 8th steal of the game to go along with his game high 22 points and 14 rebounds for a near triple-double. The final score was 62-47 in favor of the now 7-2 Hawks. This entry was posted in Sports and tagged Heritage Hawks, Lobos, Lopez Island, Tulalip by Kim Kalliber. Bookmark the permalink.